If you’re looking for a difficult challenge in life, try building a perpetual motion machine. 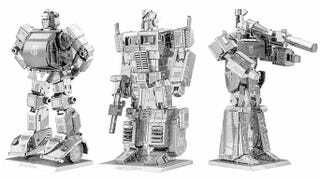 But if you want an impossible challenge, try assembling one of these intricate laser-cut metal puzzles that are now available in Optimus Prime, Megatron, and Bumblebee versions. If you’re unfamiliar with these puzzles, they start off as flat thin sheets of pre-cut steel, but hundreds of folds later you end up with surprisingly detailed models of everything from space ships to fighter jets. You don’t need glue or solder either, just a pair of nail clippers, tweezers, and ten times the patience of Mother Teresa.